Many autistic millennial generation workers have the potential to excel in digital communication roles. The longer I am involved in the contact center industry, the more fascinated I become with it. I have yet to run out of things to write and talk about, and I’ve been doing this quite a while. My longtime marketing and public relations colleague and advisor, Renee Maler of Philosophy PR (www.philosophypr.com), has counseled me to now say that I’ve been in the industry for “more than 15 years.” I may stretch it to say I’ve been in the industry for more than 20 years, but don’t tell Renee. While discussions with technology vendors about such hot topics as artificial intelligence (AI), robotics, chatbots, and of course, the cloud, are always valuable, I get the most out of my discussions with the customer service professionals who are boots-on-the-ground every day in the contact center industry. I look forward with anticipation to my regular lunch meetings with Jim Lavery, who is vice president of contact centers at Desert Schools Federal Credit Union in Phoenix. And I never fail to enjoy my phone chats with Barb Bleiler, who works at WPS Health Solutions in Wisconsin but is always willing to speak to me in her capacity as CEO of the NICE User Group (NUG), which has been very supportive of some recent research I’ve undertaken. This year I’ve been particularly fascinated by the apparent dichotomy between the focus of industry technology vendors and the focus of the customer service professionals who are running contact centers on a daily basis. While vendors try to capture buyer attention by dangling the emerging-technology carrot in front of them—emerging technologies that may be years away from delivery—customer service professionals are most concerned with employee engagement today. 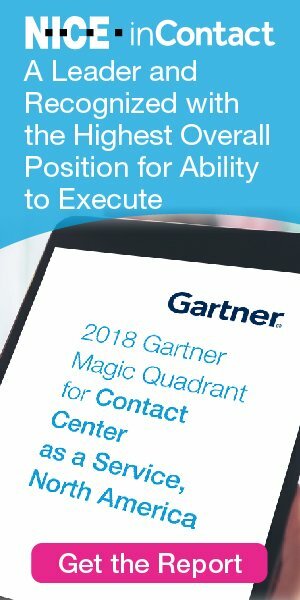 While vendors seem to be stumbling over each other to get the latest futuristic demand forecasts from the big-name analyst firms’ magic crystal balls or whatever they use, contact center executives want to know how to best address employee retention, motivation and development at this moment. This past May, I once again had the privilege to be invited to attend and speak at Verint’s customer conference, Engage, in Orlando. For the third year in a row, I co-presented with Andrew Studee of Verint’s Major Oak Consulting, and given the results of my early 2017 industry research and Andrew’s daily hands-on industry experience, we focused much of our presentation on the next generation of contact center workers and employee engagement. The millennial generation, roughly defined as those born between 1982 and 2000, are already making their impact on the contact center industry as both customers and employees, and are the focus of the majority of customer service executives that I’ve spoken with this year. According to the Pew Research Center, millennials surpassed baby boomers in 2016 as the largest living generation in the United States. According to the U.S. Bureau of Labor Statistics (BLS), millennials became the largest generation in the workforce at the end of 2015. By 2030, millennials will represent nearly 75% of the workforce. When it comes to the contact center of the future, millennials matter. Important as this statistic is, it isn’t what became lodged in my mind after our presentation was over. During our presentation at Engage, I related to attendees a story about a young woman who was in our group the previous day for a scheduled tour of Verint’s Product Innovation Zone. She was an industry journalist, probably in her mid-to-late 20s, and the entire time we were being escorted from zone to zone, she rarely looked up from her phone. She even walked while looking down at her phone. Later that evening, Verint hosted a group of us for dinner, including that same journalist, and while about everyone at the table was engaged in one or more conversations throughout dinner, this young lady was focused almost entirely on her phone. She rarely made eye contact with anyone or anything but her mobile phone. After our Engage session was over and attendees were filing out, I was approached by a conference delegate who told me that what I was describing in my millennial generation group-mate was similar to what she has observed in her experience working with autistic adults. I was immediately captivated by this idea and the brief conversation that followed. A little follow-up research made it clear that millennial contact center workers who function at some point on the autism spectrum is an industry topic that should not and cannot be delayed. Briefly, autism is a developmental disorder that is characterized by impaired social interaction and communication. It is believed to be caused by a combination of genetic and environmental factors. Other common traits in autistic individuals include repetitive behavior and restricted interests. These disorders typically continue into adulthood although in a more muted fashion. Autistic adults may be severely impaired in some respects but normal, or even superior, in others. As of 2015, there were approximately 25 million autistic people globally. What is interesting, though, and I believe is a cause for industry attention, is that according to the U.S. Center for Disease Control (CDC), autism is the fastest growing developmental disability in the United States today. Also astonishing is the fact that the prevalence of autism among U.S. children increased 120% from 2000, when one in 150 children had autism, to 2010, when one in 68 children had autism. If you can’t see where this is going, let me spell it out for you. At some point in the not-too-distant future, you’ll probably find yourself with contact center employees who function somewhere on the autism spectrum. Remember, many autistic adults will not have an intellectual disability, only social and communicative disabilities, and they’ll be looking for a job. The individual I met following my session at Engage told me that she has employees she believes have some degree of autism and that they excel at programming and other jobs where they remain focused on, and communicate only with, their computer. She also pointed out that they can function within a group if they communicate via online communities or group chats, but that they don’t function at all with a group in a face-to-face setting. When I asked why someone with autistic characteristics couldn’t function in a position such as an analytics analyst, interacting with the software to pursue business and customer intelligence, she told me that she believed they absolutely could. She also pointed out that they function well in a back-office role that doesn’t involve telephone work, and that they could conceivably function in a web chat or text message customer service role. It appears that many of the autistic millennial generation workers may come future-ready in terms of their communications preferences. They could conceivably function as subject-matter experts, communicating over social media. As long as they communicate directly with their desktop or device rather than with another person, they have the potential to excel. Although the person I had my conversation with preferred not to be identified in my column, I remain grateful to her for opening my eyes to an industry situation that will clearly impact the customer service industry now and in the future. As the industry works toward being more inclusive in terms of employment, I hope a few vendors will take their eyes off of artificial intelligence long enough to focus on maximizing the human intelligence, capabilities, and potential of the diverse workforce of the future, including those who will work at the intersection of the contact center and the autism spectrum.